Recently I was discussing the success of the Milwaukee Tableau User Group with Rob Wellen of SWC. He was on his way to a planning meeting with the Indianapolis TUG and wanted my thoughts on running or starting up a TUG. I jumped at the chance to share my thoughts and knowledge. It goes without saying that some things have worked for us and some things have not, some things that have worked for us will not work for others, and we are constantly learning. 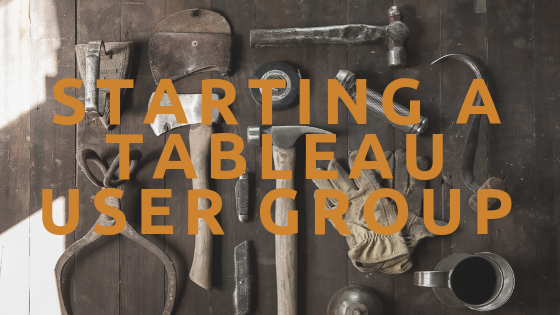 I've been the co-lead of the Milwaukee Tableau User Group for over a year now alongside Patrick Dlugosch. When we first took over leading the group we had at least five planning meeting just to organize our first meeting. Now we maybe meet once prior to each quarterly meeting. That's because we have developed our agenda, contacts, and checklists. Much of our planning can be done over LinkedIn or email. Having a template or checklist is extremely helpful both as a leader in planning the meeting, but also for members so they know what to expect. That said, this is just a template and should change based on the needs for the meeting. For example, when Dan Murray presented at our last meeting he required more time so we cut other segments. I have been attempting to line up presenters in advance for all of our meetings this year. It has been extremely helpful as I've found getting members to present to be the most difficult part of planning a meeting. When needed, I reach out to the Tableau Partners in the area to give a presentation. When I touch base with our presenters I set these basic requirements. Arranging a space for our meeting to be held has been a bit easier than finding presenters usually because it doesn't involve preparing a presentation. For new hosts I make sure to discuss the following topics. To make sure my day goes smoothly, as well as the meeting, I make sure I grab the following materials. I usually spend the week of the meeting updating my slide deck in preparation for the meeting. The slide deck evolves from the prior meeting so I don't spend too much precious time on it. That's it! Hopefully it doesn't seem too overwhelming, though I know it was for me at first. Once I developed these checklists it made planning our meetings much easier. As always, once you have the basics down you can begin to think about the next steps or new ways to make your group more engaged and excited to attend. The Milwaukee Tableau User Group is extremely lucky in that we have members who attend each meeting and are extremely involved. Some of our members have created their own groups with different objectives but similar interests. If you have any questions, comments, or are interested in presenting, hosting, or sponsoring a meeting please comment below!